Lot 337. Parthian Kingdom. Gotarzes II. Ca. A.D. 44-51. 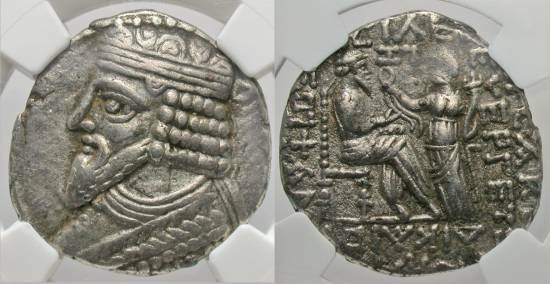 BI tetradrachm (26 mm, 12 h). Seleukeia on the Tigris, SE 360 (A.D. 48/9). Diademed and draped bust of Gotarzes II left / ΒΑΣΙΛΕΩΣ ΒΑΣΙΛΕΩΝ / ΑΡΣΑΚΟΥ ΕΥΕΡΓΕΤΟΥ / ΔΙΚΑΙΟΥ / EΠΙΦΑΝΟΥΣ ΦΙΛΕΛΛΗΝΟΣ, Gotarzes seated right on throne, Tyche standing right before him, presenting a diadem and holding cornucopia; year above, [month] in exergue. Sellwood 65.20-4. Toned. NGC XF.